I challenge myself to write 1 new hypnosis skit per day. I have written hundreds of ideas for my comedy hypnosis shows over the last 10 years, notebooks full of ideas. Unlike comedy magic though, the only way to test out a new hypnosis skit is during a live show. Since you are dealing with volunteers under hypnosis, you never know what they are going to say or how they are going to react. So the best place to test out a new skit is in colleges or comedy clubs since sometimes you think you’ve created a PG skit only to have your volunteers take it in a new direction. I started adding one new skit for every comedy hypnosis show I do. I will attempt new skits in corporate and high school hypnosis shows but I make certain they are not skits that will push the boundaries. 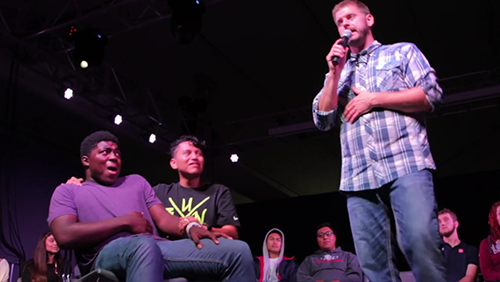 My more outrageous skits will be attempted in my college hypnosis shows. Unfortunately this limits me from adding too much new material as not every skit will make it into my full show. I performed almost fifty hypnosis shows in the past 2 months. During that time I added a cartoon dating show that was okay but after about 10 performances I doubted it would make it to my full hypnosis act. This was unlike my singing competition skit I called “America’s Next Diva.” After about five performances I knew it would become a mainstay in all of my hypnosis shows. There are skits that I created during that time that are hilarious but will belong in my comedy club and college hypnosis shows. Specifically a version of a shark tank where the volunteers have to sell a dating website they created based on their friends and their fantasies. It is hilarious but can be a little adult. This is why whenever I’m hired I allow the client to give a specific rating to my performance and I even go over all the material to make sure everything is appropriate for their event.